Shipping costs are not included in our prices. To ensure quality, fresh chestnuts must be shipped by air. We will ship the most economical way possible. Our preferred shipping method is US Postal Service Priority Mail, Flat Rate Box. USPS provides 2-3 day delivery in most of the United States. Please call if you require UPS. We accept VISA®, MasterCard®, and Discover® Cards. Select any of our chestnut items and create a custom gift box. Please call us at 503-625-1248 to order. 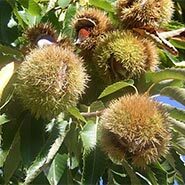 Copyright Ladd Hill Orchards Organic Chestnuts. All Rights Reserved. eCommerce Software by 3dcart.